A mysterious bitcoin tycoon with the alias PineappleFund made a million-dollar donation to the digital library nonprofit Internet Archive. 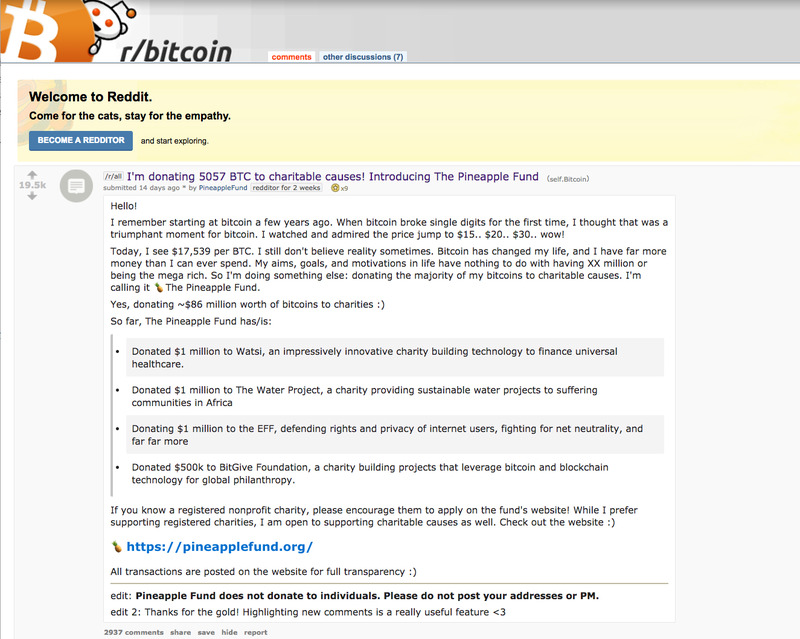 The donor, whose true identity is unknown, pledged in a Reddit post to give $US86 million in bitcoin to nonprofits, in a round of donations called The Pineapple Fund. The sharp rise in bitcoin’s value has inspired one early investor to sudden acts of generosity, the latest of which was announced Wednesday. The digital library nonprofit Internet Archive said it received a $US1 million donation in bitcoin from a mysterious benefactor,Mashable reported on Wednesday. The donation is a significant addition to the site’s yearly funding, accounting for two-thirds of Internet Archive’s $US1.5 million funding drive. This isn’t the first contribution from the mysterious benefactor, who is known only by the Reddit name PineappleFund. In a post published to Reddit earlier this month, the donor vowed to bequeath $US86 million worth of bitcoin to nonprofits. 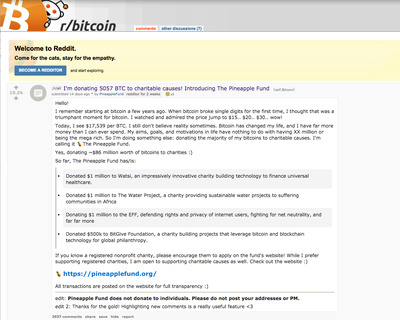 So far, PineappleFund has made several sizable donations to charitable ventures in the inaugural acts of giving through The Pineapple Fund, handing out millions of dollars’ worth of bitcoin to a healthcare nonprofit, a sustainable water project, and the Electronic Frontier Foundation.